Join River Plate Anglers for world-class Peacock Bass fishing and turn your angling fantasies into the fishing trip of a lifetime! 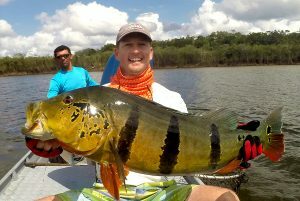 World’s best Peacock Bass fishing experience in the wild & exotic Amazon River. Giant Peacock Bass has become one of the most sought after freshwater fish species in the world. 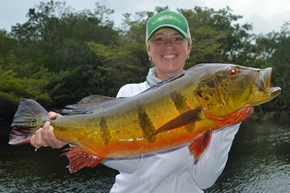 River Plate Anglers has been a pioneer in Giant Peacock Bass fishing in the Amazon river basin for more than 20 years now (both baitcasting and fly fishing). Over the years, our company has continuously evolved in order to provide our guests access to the most exclusive (privately leased) productive fisheries, plus an unprecedented level off services, facilities, comfort and safety. Peacock bass are pound for pound arguably the most aggressive, hardest fighting fish on Earth. This acrobatic and colorful jungle species readily takes flies, poppers, jigs, and noisy top water lures agressively, and offers unparalleled experiences for the most demanding angler, both for numbers of fish and sizes. It is not uncommon for a peacock bass fisherman to catch and release 20-30 fish per day… as well as payara, bicuda, pacu, redtails and other exotic species. Exclusive entry permits to fish in various Indian reserves and government preserves ensuring the best. 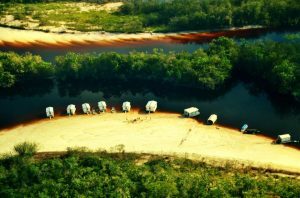 River Plate has led the way in negotiating with Indian tribes and river communities for the exclusive rights to fish pristine waters. Through patient negotiation and fair payment, River Plate has brought enormous value to its Indian partners, while securing for its fishing clients an unprecedented level of fishing quality. No one in the Amazon can match River Plate in the extent and quality of its fishing areas. They couldn’t yesterday. They can’t today. And they won’t be able to tomorrow. The reason’s simple: River Plate’s long history of fair and respectful treatment of its Indian partners and river communities and their lands and waters has insured its continuing ability to offer the best, most varied, and most extensive peacock bass fishing experiences in the world. River Plate has been operating fishing tours in the Amazon since 1992. It was the very first operator to legally obtain fishing permits in Indian Reserves. Recently, it has led the way in creating Fishing Agreement Zones where potentially damaging commercial, subsistence, and sport fishing are all under tight control. Fisheries are located in third level tributaries to the Amazon river and, only, operate for 45 days in the South of Manaus fisheries and 60 days in the North of Manaus fisheries. The fisheries in these zones are sure to remain among the best in the Amazon for years to come, providing long-term value to the Indians and river communities while also assuring River Plate clients they won’t be wasting time in marginal, over-fished water. On the contrary, clients in Fishing Agreement Zones will be assured that every angler will have two kilometers of pristine water all to themselves per season. A guarantee of low-pressure fishing like this is unprecedented in the Amazon and rare indeed anywhere in the world. River Plate’s Fly-In Floating Cabins are the ultimate solution for optimizing shallow drafting mobility. 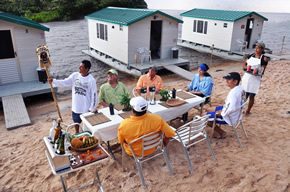 Fish in the wild and exotic Amazon River in style with comfort and luxury. 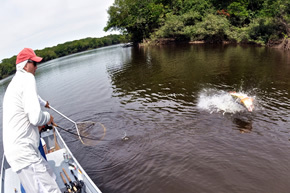 The infrastructural aspect that distinguishes our Amazon Peacock Bass fishing trips is our truly unique and highly mobile, deluxe, air conditioned Fly-In Floating Cabins, introduced in 1996, providing unprecedented level of services, facilities, comfort and safety. Undependable water levels and over-fishing are chronic problems with fixed-base operations. Many land-based lodges are situated in exclusive private-water areas but they can neither move to seek out optimal water levels nor move far away enough from their central location to reach unfished waters. 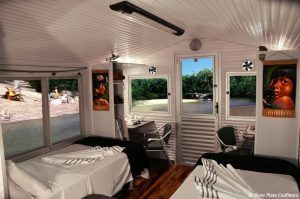 Our Fly-In Floating Cabins, however, move on an almost daily basis to unfished river segments, staying overnight along Caribbean-like white sand beaches. Learn more about Fly-In Floating Cabins ?